This book starts with a piece of 6 by 12 inch green cardstock that is folded in half so it ends up 6 x 6. I took a thin piece of cardstock that is a map. 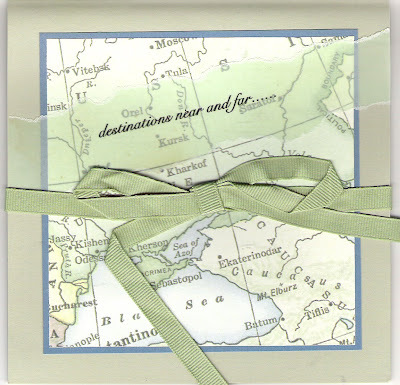 I cut it so it was smaller than the green cardstock and layered it on a medium blue cardstock that matched the map. I tore a piece of vellum on the top and bottom and stamped a verse across it and glue it to the front. I used tan cardstock for the inside pages which were cut into 10 1/2" x 5 1/4" pieces which I also folded in half to make them each 5 1/4 x 5 1/4. I took the first piece and cut a hole in the middle and left a 1 inch border around it so the center is big enough to put a picture of your trip. The rest of the inside pages are glued back to back to make them heavier so you can use it as a scrapbook or a photo album. I took a 30 inch piece of ribbon that matched the map and laid it across the center of the inside back cardstock and glued it down. I laid the last piece of tan cardstock on top of the ribbon so there was enough ribbon on both sides to make the bow in front. This was a fun and easy book to make.